An international roster of contributors come together in this comprehensive volume to examine the complex interactions between mobile media technologies and issues of place. Balancing philosophical reflection with empirical analysis, this book examines the specific contexts in which place and mobile technologies come into focus, intersect, and interact. 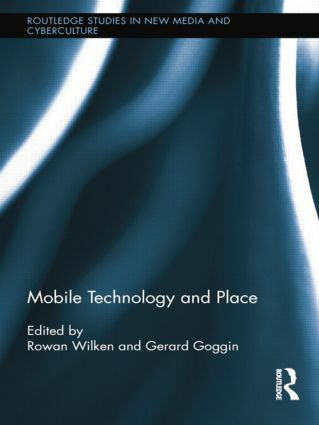 Given the far-reaching impact of contemporary mobile technology use – and given the lasting importance of the concept and experiences of place – this book will appeal to a wide range of scholars in media and cultural studies, sociology, and philosophy of technology. Gerard Goggin is Professor of Media and Communications in the Department of Media and Communications, the University of Sydney. He is widely published on the social and cultural aspects of mobiles and Internet, with books including New Technologies and the Media (2012), Global Mobile Media (2011), Mobile Technologies: From Telecommunications to Media (2009), Internationalizing Internet Studies (2009), Cell Phone Culture (2006), Virtual Nation: The Internet in Australia (2005), and Digital Disability (Rowman & Littlefield, 2003). Rowan Wilken is Lecturer in Media & Communication, Swinburne University of Technology, Melbourne, Australia. He is author of a number of articles that examine the relationship between place and media. His present research interests include digital technologies and culture, mobile and locative media, old and new media, and theories and practices of everyday life. He is author of Teletechnologies, Place & Community (Routledge, 2011).